BSNL Mobile has announced to extend the Free SIM Card offering as promotional basis across Kerala Telecom Circle for New and MNP customers (Port IN). State runs Telecom Company Bharat Sanchar Nigam Limited (BSNL) based on feedback received from various field units and from customers has decided to extend the Free SIM card offer further period of 10 days. BSNL to increase subscriber base in Kerala Telecom Circle is offering Free Prepaid SIM card to New and PORT IN (Mobile Number Portability) customers for a period of 10 days from 20th February, 2016 onward as Promotional Offer basis under Prepaid plans mobile services. BSNL to reach the target as set by BSNL Corporate Office, New Delhi, at the end of this Financial Year 2015-16 Kerala Circle is conducting Special Melas/Roadshows across the Kerala State in selected areas by offering Free Prepaid SIM card to New and MNP (Port IN) customers encouraging customers to get new BSNL connection at Free of Cost. 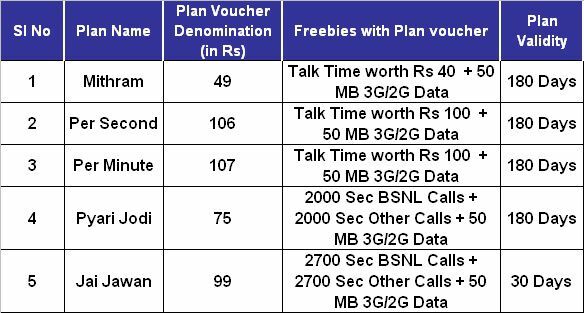 Free SIM card worth of Rs.20/- will be offered to both New as well as PORT IN customers of BSNL during this offer period. Under this offer customers have to purchase only Plan Voucher i.e Prepaid plan Voucher along with Free Prepaid SIM card connection. The above extension offer will be implemented with effect from 20th February, 2016 and available upto 29th February, 2016 for New and MNP (Port IN) customers.